Once regarded as a sort of unregulated Wild West of beauty products, Amazon has over the past few years become one of our favorite online destinations for discovering affordable, under-the-radar beauty products. Amazon's beauty department has become so legit that it now offers mainstream beloved makeup, skin, and hair brands like Stila, Sunday Riley, and Oribe. But the truly special thing about the massive e-retailer is that it's also a hotbed of lesser-known products that you won't find at Sephora or Ulta but have been tried and vouched for by sometimes tens of thousands of users. This list is dedicated to those products—to the mascara, face serums, hair masks, and more whose brand names you may not recognize but have earned thousands of positive Amazon reviews. These products cost as little as six bucks (and nothing is over $40) and will show up at your house in two days. Keep scrolling for the highlight reel of Amazon's best-selling beauty section. 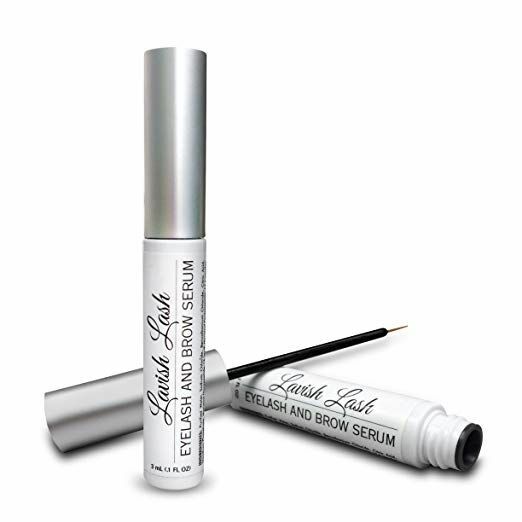 Almost 8000 Amazon reviewers have given this plant-based lash growth serum either a four- or five-star rating for its ability to repair damaged lashes and make lashes in any state grow like wildflowers. "I've been using it for two months now and OMG… it's legit," one user wrote. "I look like I wear fake eyelashes and I LOVE it!" This vintage-esque setting powder (which comes in six shades) has earned praise from over 3000 Amazon users. They love the smooth application, flashback-proof finish, and ability to keep makeup in place for hours without looking cakey. The gothic packaging on this tanning lotion might look intimidating, but you can't argue with the over 3000 rave Amazon reviews. Tanning fiends and amateurs alike are surprised and delighted by the product's pleasant smell, easy application, and natural finish. It's never too orange, just bronzed and glowy. Palettes of 16 high-quality eye shadows can run you $50+, but this one, which nearly 5000 Amazon reviewers gave a four or five-star rating, is just $14. The versatile shadows (which you can use for everyday wear or to create a sultry smoky eye) are vegan and cruelty-free, buttery and blendable, highly pigmented, and long-lasting. Even makeup artists have left gushing reviews of this palette. This highly rated mascara kit uses lengthening fibers to create the look of extensions that stay put. "It doesn't irritate, sting or burn my eyes like most on the market do," one reviewer wrote. "Exponentially longer, thicker lashes without the misery of flaking or annoyance of smearing," said another. "At this point, I'd give it more than five stars if I could." Well over 14,000 Amazon reviewers are obsessed with this affordable face and body mask, which uses 100% calcium bentonite clay to clear acne, unclog pores, and brighten the skin without irritating even the most sensitive skin types. It does not contain synthetic additives, fragrances, or animal products. Just mix it with equal parts apple cider vinegar or water, and leave on for 15 to 20 minutes. Look to this fanatical review to get an idea of how much users love this stuff: "It's an official holy-grail product of mine. I ideally use it once a week, and it feels as if angels themselves have taken the time to delicately renew my skin." Minimal packaging and low-key marketing allow this 72% organic brightening serum to remain so low in price. The elixir is formulated with vitamin C and hyaluronic acid for protected, wrinkle-free, and glowing skin. I am personally a fan of the product, as are over 2000 Amazon reviewers. Dehydrated skin types will love this ridiculously moisturizing, non-greasy serum made of 100% organic and pure sodium hyaluronate (aka, hyaluronic acid). "I've been using it daily for almost three weeks now, my face is softer and plump, cannot live without this bae!" says a recent review. Who says effective retinols have to cost $100? This youth-inducing skincare essential (also formulated with active ingredients like hyaluronic acid and vitamin E) might only be $20, but thousands of reviewers swear it noticeably stops breakouts and softens fine lines and wrinkles. This sleeper hit product has over 5000 positive Amazon reviews, thanks to its genuine ability to improve the look of dry flaky skin, wrinkles, stretch marks, scars, hyperpigmentation, and uneven texture. The only caveat is it takes two months or so of use to produce the best results, but reviewers promise with consistency, you'll notice soft, smooth, even skin. Damn—nearly 28,000 reviewers have left glowing reviews of this one-inch ceramic flat iron, which is dual-voltage, heats up to 450 degrees (and does so fast), and has a convenient extra-long cord. One reviewer summed up the thoughts of many when she wrote: "Feels really professional and state of the art." "I have been using Arvazallia for the last three years and I have found nothing else that works as good as this," one user wrote of this little-known $13 mask. "My hair was damaged very badly from years of dying and bleaching. … After using Arvazallia the first time I noticed that it had already started helping. After about five treatments, my hair was silky smooth, thick, hydrated and had volume I had not seen since I was a teenager. I would recommend this product [to] anyone." Those with thin, flat hair should consider giving this clinically proven shampoo a try, especially considering its 7000 plus positive reviews. The product uses effective plant ingredients that help promote hair growth, like nettle extract, saw palmetto, he shou wu (which boosts circulation), and biotin-rich red Korean seaweed. "This really seems to be working better than anything else," reads one of the many reviews. "It makes the hair noticeably healthier. I've gotten comments about it from friends. Good stuff!" Pair that shampoo with this budget-friendly conditioner, which makes use of amino acids, jojoba, and keratin to repair damaged hair so effectively that over 7000 Amazon reviewers are hooked. Castor oil is well known for its ability to strengthens hair follicles for healthy, shiny hair. The brand suggests applying this 100% natural formula to the scalp, covering with a plastic cap, and sitting under a hair dryer for 30 minutes before shampooing. Amazon reviewers swear the product repairs even the most damaged, hopeless hair. Next: Don't miss 25 beauty products our editors tried and loved in March.